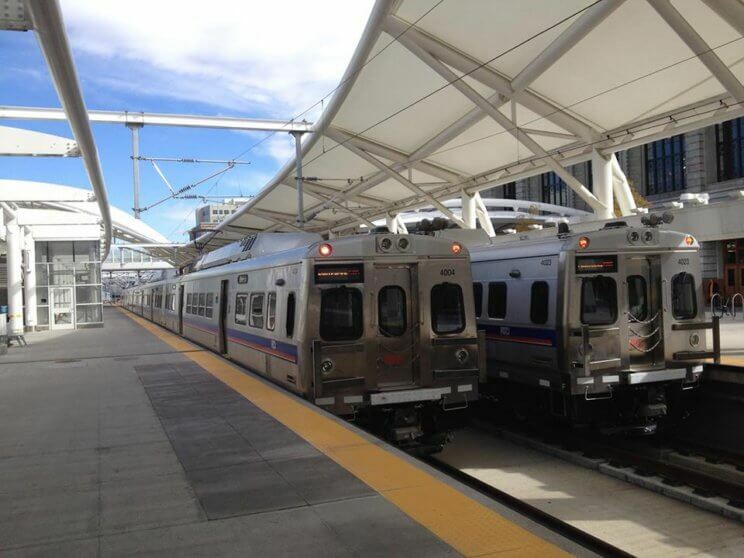 Every fifteen minutes the A Line reliably transports travelers and locals between the Denver International Airport to Union Station in just under forty minutes. 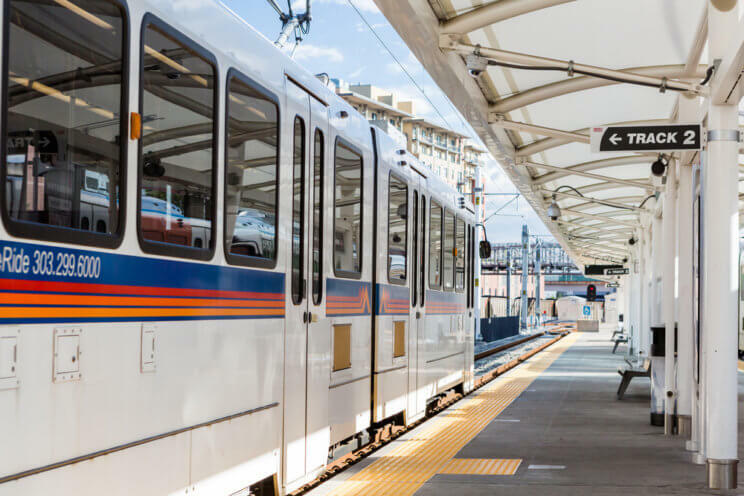 From the airport there are seven stops and each one is close to a great places to eat, walk in nature, grab an Uber to find a close and interesting spot to visit. The Moonlight Diner (17 min walk/3 min drive)is a short ride and walk away to classic food served in a classic boxcar! Enjoy homemade sandwiches, soups, and salads and are well known for their Green Chili and Corned Beef Hash. If you get in at midnight you can still get breakfast food as they serve it all day. DiCicco’s Italian Restaurant (29 min walk/5 min drive) was started in 1956 by a family who wanted to bring their best Italian recipes for the community. Through out the years they have created homemade food that has delighted generations. With pasta, pizza and dinner specials this lovely little spot is a great stop on the A-line! Uno Chicago Grill (23 min walk/5 min) brings the deep dish love to the mountains. They make the pizza dough every morning and serve it up with your favorite toppings and craft beer. Thai Chili and Sushi (20 min walk/5 min) offers Thai and Japanese flavors and dishes. An extensive menu with Thai Curries, Lo Mein, Sushi rolls and Sashimi there anyone who enjoys Asian flavors will find something here after a short train ride and a brisk stroll from the airport! While this spot is more in an industrial area there are some gems to be found in this area as well! Just a short walk away from the train stop is a trio of enticing shops. The El Angel Market (17 min walk/4min) has groceries and a restaurant and bakery. Or, for really fresh tortillas and other baked goods, step next door to the Tortilleria San Juan. If you are just wanting to get a bite to eat, try the Taqueria El Valle Restaurant who have good reviews for serving authentic food with good service. After getting your food and tortillas it is just a five minute walk to Sand Creek Park (35 min walk/5 min) with a great trail system that stretches 14 miles through Commerce City Denver and Aurora. Stroll a section of the trails and enjoy some of the natural beauty that Colorado has to offer. You can visit the Bluff Lake Nature Center where they have Qigong and Mindfulness Walks every Sunday and Family Days on the last Saturday of the months where you can meet wild animals and learn about the Colorado landscape. If you happen to wander onto the Anschutz Medical Campus (48 min walk/6 min drive) than take time to raise a glass at Ursula Brewery. With a number of award winning brews to their name they specialize in German and Belgian brews and serve food from Cedar Creek Pub, a sister restaurant just across the street. Or you could grab a bite and a pastry at Etai’s Bakery Cafe just a little bit further down the road. If you fancy going for a stroll in the park that gave the station its name than Central Park is only 20 min walk/ 5 min drive. However, a little closer is Station 26 Brewing Co. (19 min walk/5 min drive) which features great beer served in an old fire station. They have a number of interesting brews like Something Borrowed, Something Brewed (a beer-wine hybrid) and Bang Bang Double IPA or Time Lord ESB (english-style bitter). If you missed the stop at Peoria station you can still get some thing to eat at Etai’s Bakery Cafe (26 min walk/6 min) in Sapleton, but if you are wanting to burn a few calories before biting into some delicious fresh baked bread and pastries then this would be the stop to do it at. If you are looking for food in the area you can see Four Friends Kitchen (26 min walk/5 min drive) serves up Southern Food like beignets, Jalapeño Chorizo Hushpuppies. Kids can get an Etch-a-Sketch to play with and maybe adults can too if they ask nicely? Traveling can be stressful so stop into the Blue Creek Therapeutic Health Spa (28 min walk/7 min drive). They have a number of great packages from massage, acupuncture to skin care. Pamper yourself! Psst… If you get there on a Sunday between June and October you can visit the Stapelton Farmers Market (26 min walk/6 min) and get fresh fruit, vegetables and local delicacies. Prodigy Coffeehouse (6 min walk/3 min drive) serves up craft drinks and treats while looking for opportunities to educate and serve the youth in the community. Patrons can order great drinks and will often find vegan and gluten free options, while getting to know the apprentices who learn to serve coffee while also getting support in developing their skills and professional lives. Qi Flow (20 min walk/ 5 min) offers a free class so interested individuals can enjoy one of the 40+ classes per week. They offer a range of cardio (cycle and HIIT) and movement (yoga and qi flow) as well as personal training so there is variety to choose from! If you are just in Denver for a day this might be a great way to get a workout in or if you are from the aea make it your routine to get your Flow in during the week. Tighe Brothers Distillery (18 min walk/5 min) serves up the fine spirits and a deep appreciation of Bourbon whiskey. They offer tasting tours every Saturday so you can see how love creates delicious alcohol. Agnes Of Glass – Glass Blowing Workshops (17 min walk/4 min) could be a great way to spend a longer layover or have a great evening out learning about handling molten glass. Usually open through out the day, you can wander through, see the custom glass creations by Agnes Sanchez and take home a keepsake. Blue Moon Brewing (12 min drive/6 min) is well known in Denver, as their signature brew Belgian style brews were created and sold at Coors Stadium more than 20 years ago. The expansive tasting room serves food as well as brews and they post the bitterness rating on the menu so patrons can easily choose a beer that they will enjoy. Zeppelin Station (5 min walk) is a hipster food court with great choices for all foodies. Currently serving raman, smoked meats and Indian street snacks this rotating offering of good food and atmosphere this is a great stop along the A Line. Black Shirt Brewing (2 min walk) supports the Denver community with award winning brews and great events happening throughout the week. They have comedy and quiz nights with local and touring bands thrown in for good measure. The Source (12 min walk/6 min drive) is another hipster food court and soon hotel! With pastries that are worth standing in line for, artisan beer and amazing restaurants to choose from, The Source would be a great place to spend a layover. 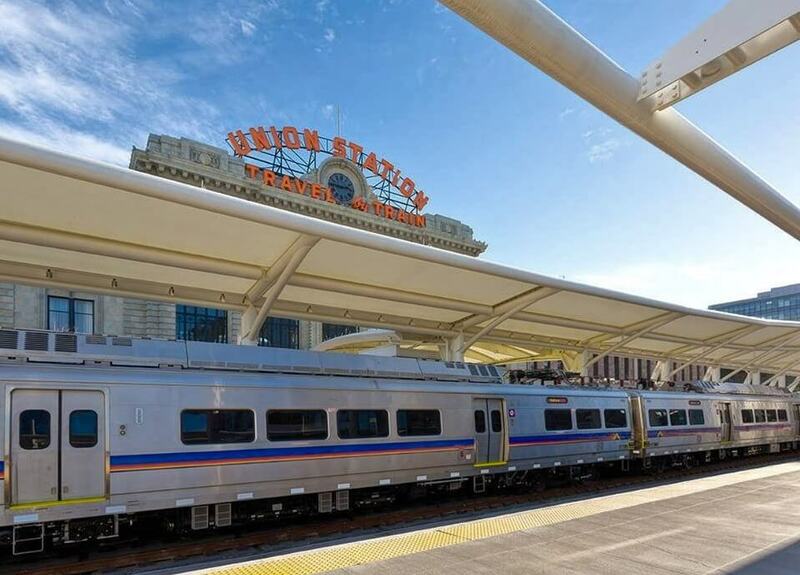 Union Station is central Denver and is one of the reasons this line is so important. It gets travelers to the Colorado Convention Center in a jiffy as well and the 16th Street Mall and connecting trains to south Denver. If you haven’t had a chance to explore around that area then check out these great places! Dairy Block was once the place to milk the cows but has moo-ved on (yep, bad cow pun. You’re welcome) to be a swanky spot in downtown Denver. You can try one of the great restaurants like Kachina Cantina and Polka Lola Social Club, stay at the hotel The Maven, use one of their work spaces, go shopping at Berkley Supply or pick up flowers at The Perfect Petal. The being the Diary Block you can get all things dairy related at the Denver Milk Market. Coors Field is a short walk away and a besides being THE place to see high-altitude baseball you can tour the stadium Monday through Saturday (when games are not going on, of course).